In 2018 DB Max are bringing you the midweek ‘Summer Chilly Duathlon’ held on the first Wednesday of July, August and September. Traffic-free midweek duathlon racing at the Castle Combe Race Circuit and comprising a 2-mile flat run, followed by a 10-mile flat bike on super smooth tarmac, topped off with another 2-mile run to finish. The event starts with a 2 mile run on the perimeter of the race track, then heads out on 5 laps of the circuit before finishing with a final 2 mile run again around the race track perimeter. DB Max Chip Timing including splits and bike laps. Duathlon: 2 mile run (one perimeter lap), 10 mile bike (five race circuit laps) , 2 mile run (one perimeter lap). On arriving at Castle Combe, please use the competitor entrance to access the venue. The postcode for Sat Navs is SN14 7EY. The venue has plenty of parking. You will be directed in to the circuit from the main road through the main competitor gates. Please drive with considerstion to other users. Registration is from 17:30 and will close 15 minues before the final race start. Briefings will take place ten minutes prior to race start at transition. To successfully run our events we require the help and support of Marshals and Volunteers. if you are able to assist at the event or have friends, family, work colleagues or enemies who may be able to help, then please contact James Higgs on james@dbmax.co.uk in return we offer free entries in to future DB Max events. 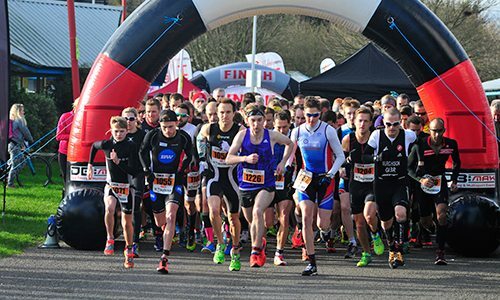 If you have any questions or queries regarding the Summer Chilly Duathlon, then please do not hesitate to contact James Higgs on 07929 059 796 or james@dbmax.co.uk.